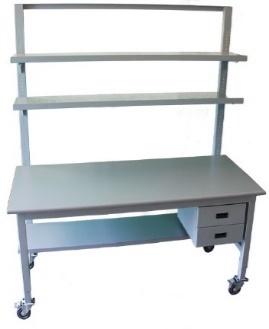 Our 4 Leg Workbenches are fully modular, i.e., they can be easily sized and configured as needed for your application. Select from a wide variety of accessories, components, and dimensions. The photos below are examples – “idea starters”. 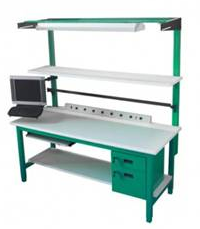 See the J4L Guide for the Full Range of Available Workbench Accessories. 2’ – 10’ lengths. Multiple depth and height options. Any worksurface and/or shelf material. We’ll help you match the optimal material to the application, whether it’s biotech, electronics….or the warehouse. We’re custom-friendly! 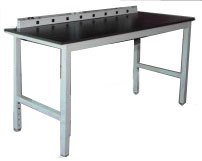 Just contact us and we’ll work out your ideal, non-standard lab bench design, at a surprisingly reasonable price. We fully support our customers’ needs for their optimal, individualized configuration(s). How? By offering the industry’s most comprehensive selection of productivity accessories & components: Drawers – Power Channels – Shelving – Task Lighting….and that’s just the start. Contact us. We are committed to professional, attentive customer support. We will work closely with you to help define your optimal configurations. Steel 4-leg frame and a top. Specify size & worksurface material. Add available accessories & options as needed. 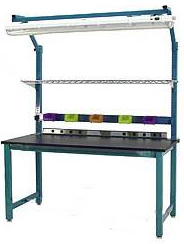 #J4L3660-E: 36×60 ESD electronics lab workbench, fixed height shelf supported by box risers with 8 outlet power backsplash, box drawer, adjustable footrest. 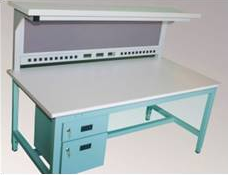 #J4L2448-M: 24×48 mobile lab workbench, HPL worksurface, two adjustable shelves on uprights, two box drawers and lower shelf. 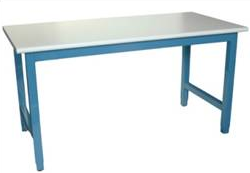 #J4L3060-R: 30 x 60 science lab bench with phenolic resin worksurface, power backsplash, leg inserts for height adjustability.